When it comes to your wedding day, there's one other outfit that's nearly as important as the bride's, and it's not what you'd expect: It's the mother-of-the-bride's look. When I got married, my mum was quite worried about looking too much like she was the mother of the bride. She wanted to look cool and sophisticated but still her age. She also wanted to make sure that she suited the tone of the day and fit in with the rest of the bridal party. This meant that alongside hunting down my frock, there was a fair amount of time looking for my mum's, too. And I totally get it—it's a big day for her too. Hannah's mum, pictured centre left, ended up in a gorgeous Eudon Choi dress. "This was the second dress my mum tried on—and she was so worried about even finding something! Eudon Choi came to the (very fast) rescue in Fenwick one day," reveals Hannah. "She was exactly like me—not wanting to opt for something traditional. My wedding was in Spain, and we both felt the flamenco vibes and red carnations. Who knew we'd locate such a perfect, timeless, unusual dress so easily? Also, how cool that my mum wore one of London's most exciting young designers?" 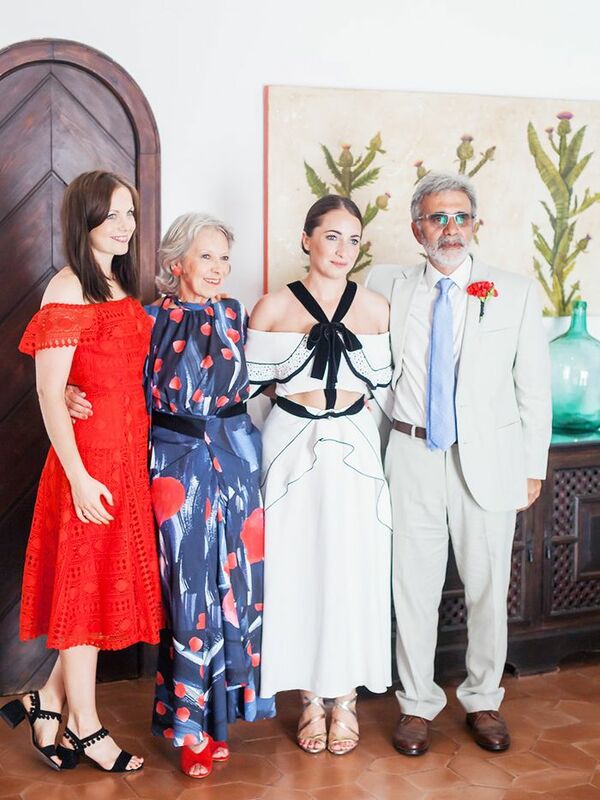 Hannah's mum really didn't want to go anything too classically "mother-of-the-bride": "I had already decided that I didn't want to look like a clichéd English mother of the bride, and the no-hats-or-fascinator rule helped create a not-too-formal vibe. I'm fairly minimalist in my day-to-day wardrobe, so any hints of bright colours and florals were immediately eliminated. I went by the 'I'll know it when I see it' strategy, looking at anything from high street to designer outfits. I rejected most offerings as too frilly, too flouncy, too formal, which all made me feel uncomfortable despite the positive feedback. I needed an understated elegant look for an emotional day. By the time late May came around, panic had set in, so I adopted a different strategy. I decided to go into every shop I wouldn't normally consider. The final outfit? A taupe Armani dress with matching jacket perfect for the 26 degrees and wall-to-wall sunshine and minus the jacket for late-night dancing." "When I spoke to my mum about how she wanted to feel and look on my wedding day, she said 'like Audrey Hepburn,'" Elinor tells us. "Thing is, by her own admission, she's very much a jeans-and-T-shirt sort of person and says she always finds it hard to feel good when she's dressed up (even though she always looks fabulous). To help her decide what to wear, we went into department stores, and my sister, my mum, and I would select a few looks each, and then she had to try all of them on, even if she wasn't sure it was what she wanted. The only rule was that she wanted to adhere to my colour scheme. As my bridesmaids were all wearing blue shoes, she decided to go for a blue dress and hat in the end. The hat was actually pretty important to her. While she wanted to avoid a typical MOTB dress. It's drama really added to the outfit." This is flattering and simply stunning. For something with a touch of fabulousness. If you're looking for something more structured. Want more? High-street wedding dresses have never been so chic.